The link between asbestos and mesothelioma was first reported in a study of German asbestos workers conducted in 1943. Although this study found a link between lung scarring caused by asbestos fibres - known as asbestosis - and cancer in the mesothelial cells of the lungs and chest, it wasn't until the 1960's that the link between asbestos and mesothelioma began to become widely recognised by the medical community. Asbestos: It may look harmless, but if inhaled or ingested it can lead to serious health problems. It took even longer for the general population and industry to take notice of the results, with asbestos being widely used in the Australian housing industry up until 1990. A total asbestos ban was put in place in Australia in 2003 but in many parts of the world, such as Russia, it is still legal to use and even mine asbestos. Mesothelioma is a type of cancer that affects the body's mesothelial cells (the cells that cover most of the body's internal organs) and is caused by exposure to asbestos. This exposure could occur from inhalation or ingestion; usually by undertaking renovations, through contaminated talcum powder or through work. There are three types of Mesothelioma, all of which are fatal, and can take anywhere between 10-50 years to develop. Pleural Mesothelioma is the most common, accounting for 80-90% of all mesothelioma cases. It occurs when asbestos damages the pleural lining that surrounds the lungs and chest. As it is a respiratory condition symptoms include chest pain, shortness of breath, fluid in the lungs (known as pleural effusion) and a dry cough. Peritoneal Mesothelioma is the second most common type of mesothelioma and each year just under 500 people are diagnosed with this condition globally. This type of mesothelioma occurs when asbestos damages the peritoneum - the thin membrane surrounding the abdomen. Individuals diagnosed with peritoneal mesothelioma usually have a higher rate of survival than those with one of the other two kinds. Pericardial Mesothelioma, like the name implies, effects the lining surrounding the heart cavity. Because it is extremely rare, the prognosis for patients with this type of mesothelioma is usually around six months. Home renovators should be cautious of asbestos. Even though asbestos has been banned here for close to 15 years, Australia still has one of the highest rates of Mesothelioma in the world. In Australia 759 cases were diagnosed in 2014, and a further 675 cases were diagnosed in 2015. This high rate of mesothelioma is primarily due to the high amount of asbestos in our existing housing supply and our nation's love of home renovations. If you suspect your house might contain asbestos, don't try and remove it yourself, do the safe thing and call in an accredited assessor or a licensed asbestos removal contractor. Until usage was curbed in the 1980's, Australia had one of the highest rates of asbestos usage per person in the world. In 2003 a total ban was placed on asbestos in Australia, making it illegal to mine, manufacture, export or import the deadly substance. However, this ban couldn't account for all the asbestos already in the housing supply and previously we have talked extensively about the amount and dangers of this legacy asbestos hiding in Australia's homes. This asbestos is usually found in two forms: Friable and non-friable. The good news is that if you live in Sydney your house is likely to contain non-friable asbestos, which is the least dangerous of the two as the asbestos fibres are contained in a bonding agent, like cement. 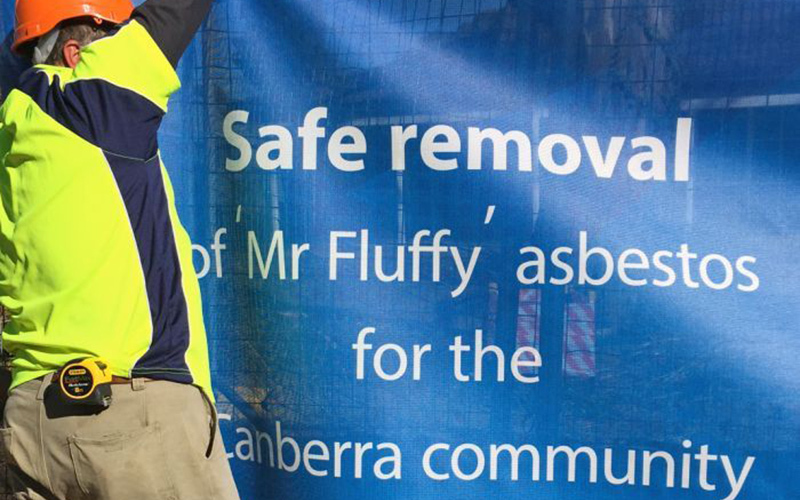 Although friable asbestos has been found in some Sydney homes, it saw more widespread use in colder parts of the country like Canberra. Although certainly less hazardous, non-friable asbestos should still be treated with caution as any damage can break the seal and release dangerous asbestos fibres into the air. In NSW it is legal for home owners to remove up to 10m2 of friable asbestos themselves; however, this is not recommended and is even illegal in other states, like Victoria. Friable asbestos removal is always a task best undertaken by licensed professionals as it is a tedious and delicate process. During removal each panel of friable asbestos must be removed individually and intact while being sprayed with water to ensure no asbestos minerals become airborne. Once the asbestos containing material has been removed it must be wrapped in plastic ad placed in a skip for proper disposal. Overall, removing friable asbestos is safe and can even be relatively low risk if undertaken properly. However, given the margin for error, it can also be very unsafe if undertaken without thought, planning and the proper safety considerations. How Much Will It Cost To Remove Asbestos From My Home? During its time as a ‘miracle mineral’ asbestos saw wide use in Australia, particularly in the construction industry. Coveted for its durability and resistance to heat, asbestos fibres were used in everything from fibre cement sheeting (often referred to as fibro) to insulation and even as a paint additive. Corrugated asbestos cement sheeting and asbestos cement sheeting: two examples of non-friable asbestos. Although a total asbestos ban was implemented in Australia in 2003, there is still a high volume of asbestos in the existing housing supply, specifically in houses built or renovated before 1991. Today as a result asbestos removal and disposal is big business. Under Australian law, in order to remove quantities of asbestos larger than than 10 Square metres you need to have an asbestos removal licence. There are two types of licences that you can acquire to perform asbestos removal: a Class A licence for both friable and non-friable asbestos and a class B licence for non-friable asbestos only. In this blog we will take a look at the more common variety of these two types of asbestos: non-friable. Non-friable asbestos refers to Asbestos Containing Materials (known as ACMs) in which the asbestos particles are tightly bonded. This is usually done with a bonding agent like concrete or plaster. The presence of this bonding agent means, that unlike friable asbestos, the asbestos fibres are unlikely to break or crumble. Compared to friable ACMs, which can consist of 100% asbestos fibres, non-friable ACMs contain a relatively low amount of asbestos, usually no more than 15%. Once you strip a fibro home of its asbestos sheeting, there is not much left. For these reasons non-friable asbestos is the safer of the two types and usually poses little threat to human safety if intact and undamaged. However, it does pose significant risk if it is broken or cut in anyway as it breaks this bond, potentially releasing dangerous asbestos fibres into the air. Non-friable asbestos must be removed carefully by hand to ensure the ACM is undamaged and unbroken in the removal process. The ACM is then wrapped in plastic and gently placed in a skip for disposal. Some common non-friable asbestos products include Fibro, Super Six corrugated cement sheeting, flue pipes, cement roof shingles, sprayed insulation and boiler insulation. Home renovators should proceed with caution when dealing with asbestos. Bar far the biggest risk posed by non-friable ACMs is to renovators, who often cut or grind these products without realising they contain asbestos. 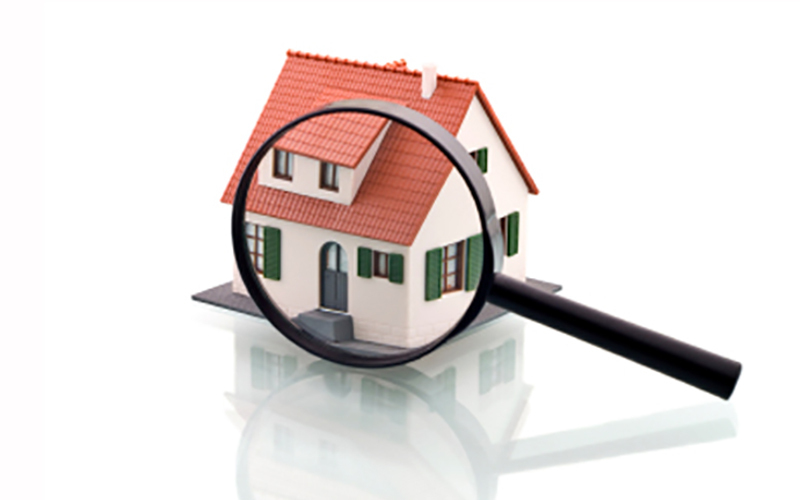 If you live in an older home and are thinking of renovating it is important to have the property inspected to see if any asbestos is present before commencing renovations. The Emotional Toll Of Asbestos Exposure. Discussions around the negative health impacts of asbestos exposure usually begin and end with discussions about the negative effects on an individual's physical health. Obviously the physical symptoms and extreme pain associated with conditions like mesothelioma shouldn’t be downplayed, but by only focusing on these physical symptoms we exclude the emotional and mental struggles of those diagnosed with asbestos related diseases. Getting a mesothelioma diagnosis is a very shocking and stressful experince. Currently, not a lot of research has been done on the mental and emotional strain experienced by those suffering from the physical affects of asbestos exposure. To help amend this and provide some ideas for new research, a literature review of exisiting research was published in the American Journal of Industrial Medicine. Even just being exposed to asbestos can bring mental anguish: Just knowing you have been exposed to asbestos, and therefore could have asbestos fibres in your body, causes mental distress. This distress can take the form of depression, anxiety and anger. Mesothelioma causes significant mental and emotional distress: Not surprisingly, all existing research indicates that living with mesothelioma is extremely stressful. This stress starts at diagnosis, with studies documenting stress reactions such as shock, anxiety, depression and anger. Something that can help to alleviate this stress is having access to medical health professionals with strong communication skills and experience treating mesothelioma patients. More research needs to be done: The biggest take home from the literature review was just how little research has been done on the topic. Indeed, the take home from all of this is how much more research work needs to be done to look after those suffering from the devastating effects of asbestos exposure. Although it is commonly known that asbestos once saw wide use here in Australia, most people might be unaware of just how many products the deadly mineral can be found in. This is particularly concerning for home renovators who may tear up tiling or start sawing a segment of panelling unaware that it contains deadly asbestos fibres. Asbestos could be hiding in your home where you least expect it. Apart from the obvious suspects, like asbestos fibre board (commonly known as fibro) and loose fill insulation products like Mr. Fluffy, asbestos could be hiding in your home in a variety of unexpected places. In this article we take a quick look at some of the less obvious places asbestos can be found in the average home. Paint: During its time of wide use in Australia, asbestos was often used as an additive in paint. The mineral was added primarily because it was a cheap way to increase the paint's tensile strength and durability. Roof shingles: If your roof is comprised of cement fibre shingles then there is a chance they could contain asbestos. These shingles are usually dappled grey, especially if they are weathered, and at first glance they might look like sheet rock or slate. Given their exposure to the elements, the risk of asbestos fibre cement shingles becoming damaged and releasing asbestos fibres into the air is fairly high. These roof shingles may look like slate, but they are actually made of asbestos fibre cement. Flue pipes: In older homes, flue piping and water piping can sometimes be made out of asbestos fibre cement. Given that asbestos fibres can travel freely in water it should be a priority to remove any damaged asbestos cement piping as soon as possible. 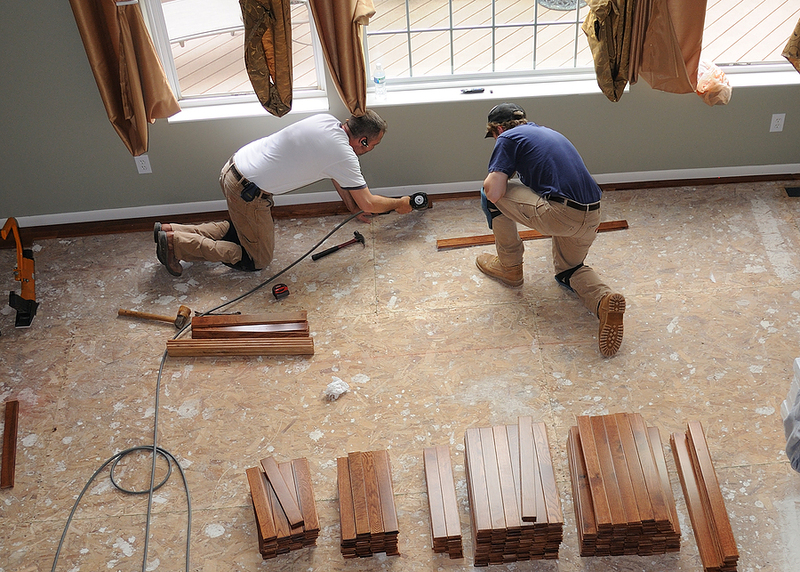 Under vinyl sheet flooring: Some vinyl flooring products contain loosely bound asbestos on their underside. Although the exposed side contains no asbestos, the felt-like underside is comprised of between 80-100 percent asbestos. Although this asbestos is unlikely to cause issues if the vinyl floor remains intact, damage to the floor or renovations could expose the loose asbestos fibres contained underneath. The shed: That’s right, your humble garden shed could be harbouring asbestos in the form of asbestos cement sheeting. Commonly known as ‘Super Six’ this asbestos cement product was commonly used as roofing, and sometimes walls, for small outside structures like a shed or an external laundry. Well, there you have it. Please keep in mind that this list is by no means comprehensive and homeowners should seek out the help of professionals to identify and remove any asbestos in their home, especially if it is posing a risk to the occupants. In modern Australia asbestos is a word synonymous with danger and disease, but it hasn’t always been this way. There was a time when asbestos was hailed as a miracle material, prized for its incredible heat resistant properties and seen as an important resource. A hallmark of the western world’s asbestos legacy are the now defunct asbestos towns, places that grew out of, or flourished, due to asbestos mining, but are now mostly forgotten. Although it might seem hard to believe, this Canadian town isn’t the only place to take its name from asbestos. In a previous blog post we took a look at Asbest, the Russian word for asbestos and the Russian city home to the world’s biggest functioning open pit asbestos mine. Previously, this 'honour' - if you can call having the world's largest asbestos mine an honour - belonged to Asbestos' Jeffery mine. Opened in 1870, the Jeffery Mine - known to locals simply as 'the hole' - gave the town of Asbestos its name and employed a majority of its residents. As is often the case with settlements built around asbestos mines, as the mine flourished so did the town. During this asbestos boom Quebec provided as much as half the entire world's supply of asbestos. Predictably, the price and demand for asbestos plummeted in the 1980s as the negative health impacts of asbestos exposure became harder and harder to ignore. This lead to the Jeffery mine finally closing its doors in 2011, 8 years after Australia banned asbestos completely. At the time of the mine's closure the town was home to 7,096 people, 2000 of which worked at the Jeffery mine. So where is the town of Asbestos now, you ask? Well, in 2012 the town was given a $50 million diversification fund from the Parti Quebecois government, replacing a promise of a $58 million loan to renovate and reopen the mine from the previous government. Using this grant Asbestos has managed to attract a pharmaceutical company, a duck hatchery and meat processing plant, a cheese factory and a microbrewery. This grant has also helped the town 're-brand' by demolishing all unused mining buildings. In a somewhat ironic twist, earlier this year it was revealed that Asbestos may be able to strike it rich from asbestos yet again. As it turns out, the tailings left from mining asbestos are rich in magnesium - a useful mineral that can be turned into a metal. While the town of Asbestos may be changing, one thing that isn't is the name. Despite several attempts to change it, it seems for now anyway, that the town is still stuck with its somewhat unfortunate name. Truck Dumps Four Tonnes Of Asbestos Outside Oatlands Home. Late last week a hazmat team was called to remove four tonnes of waste dumped in a driveway in suburban Sydney. Security camera footage of a truck dumping suspected asbestos in the driveway of an Oatlands home. Just over four tonnes of material were dumped in the driveway of the Oatlands home when a mysterious truck pulled up and unloaded the material late on Saturday night. The bags spilt open as they hit the ground exposing the property’s occupants to the potentially deadly contents. The dumped material is believed to contain asbestos and is currently being tested. This aforementioned incident is just one of many asbestos dumping events that take place in Sydney, such as the tonnes of asbestos dumped on a street in Sydney’s Chester Hill late last year or the various illegal asbestos dumps committed by Dib Hana. Why is this happening? Well, one potential answer has to do with the high price of legally and safely disposing of asbestos. Here at Ausbestos we accept that this is just the cost of doing business in the asbestos removal industry but unfortunately some dodgy individuals try and avoid this cost by illegally disposing of asbestos containing products and asbestos contaminated soil. In the process they put themselves and the community at risk. When disposing of asbestos it is important to wear the proper protective gear to prevent inhalation of fibres. In the state of NSW hefty fines apply for the unlawful disposal of asbestos, which can range as much as a $7,500 on the spot fine for individuals and a $15,000 on the spot fine for corporations. If you come across illegally dumped asbestos in your community or witness illegal asbestos dumping then you should notify the NSW Environmental Protection Agency by calling 131 555. Alternatively, if the dumped asbestos is of immediate harm to human health then you should call 000 and to report it immediately. Asbestos Contaminated Soil Illegally Dumped In Sydney's West. Johnson And Johnson Looses Asbestos Lawsuit. A New Jersey court has ordered pharmaceutical and manufacturing giant Johnson & Johnson to pay $37 million in compensatory damages and a further $80 million in punitive damages, to plaintiff Stephen Lanzo III and his wife. Mr Lanzo claims he developed mesothelioma, a disease caused by inhaled asbestos fibres reaching the lung’s pleural coverings, from using Johnson & Johnson products he used between 1972 to 2003. The products he says are responsible - Johnson & Johnson’s Shower to Shower and Johnson & Johnson's Baby Powder - both contain talc. Talc is a naturally occurring grey mineral made of hydrated magnesium silicate that generally forms near or beside asbestos deposits. It is a common ingredient in personal care products like baby powder and make-up and this Johnson & Johnson case is not the first time asbestos has been found in talc used in consumer grade products. Predictably, Johnson & Johnson have denied claims that their talc based products contain any asbestos fibres, with their lawyer even going as far as to suggest that Mr Lanzo could have been exposed to asbestos through the pipes in his childhood home. However, the jury did not agree with this hypothesis and ruled to award the plaintiff with damages after just one day of the trial. If Johnson & Johnson’s denial tactics sound oddly familiar, that's because they, unfortunately, are. As we saw in the case of fashion accessory chain Claire’s, which we previously covered, it is common for companies accused of selling products contaminated with asbestos fibres to fiercely deny such claims, even in the face of compelling evidence. Fortunately, it seems these denial tactics employed by companies like Johnson & Johnson and Claire’s aren’t working long term, with Johnson & Johnson currently facing over 6,600 more lawsuits related to its talc based products. In Australia, asbestos has been banned since 2003; however, it is a different story over in the United States, where the Johnson & Johnson case took place. Troublingly, there are currently no federal regulations in the US that requiring that talc used in consumer grade products, such as baby powder or make-up, is asbestos free and the FDA (Food and Drug Administration) can only take action if there is sound evidence that shows that such products are harmful. Although, as Australia’s legacy problems with asbestos show, banning asbestos may not be a catch-all solution, it is an essential starting point to an asbestos free future. The Cost Of Not Removing Friable Asbestos Safely. 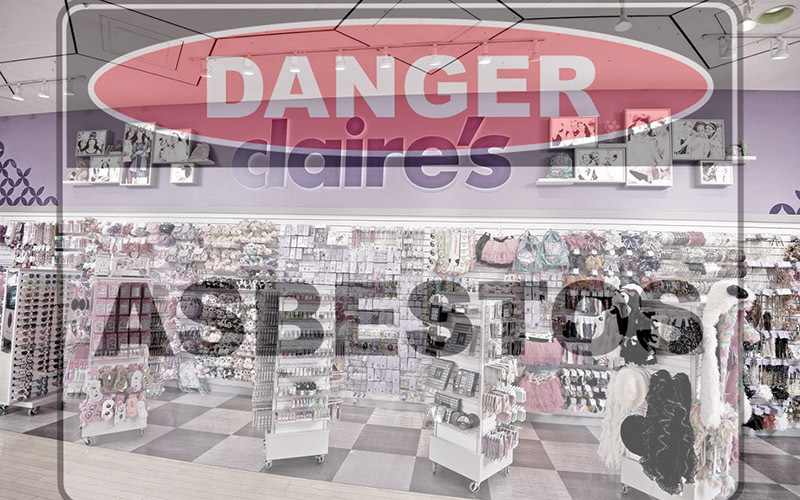 More Asbestos Woes For Fashion Accessory Chain Claire's. 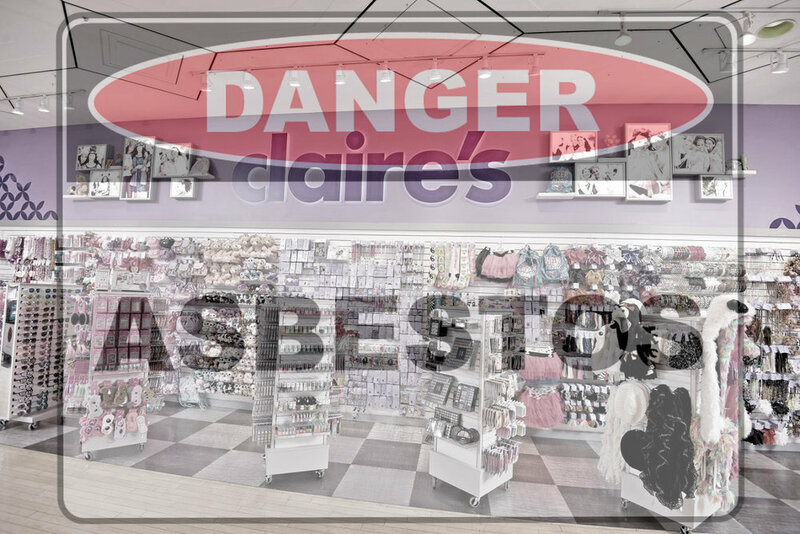 More Asbestos Woes For Fashion Accessory Chain 'Claire's. Two months ago we shared the news that lab tests conducted by the Scientific Analytical Institute had found traces of deadly asbestos in 17 make-up products sold by fashion accessory chain Claire’s. 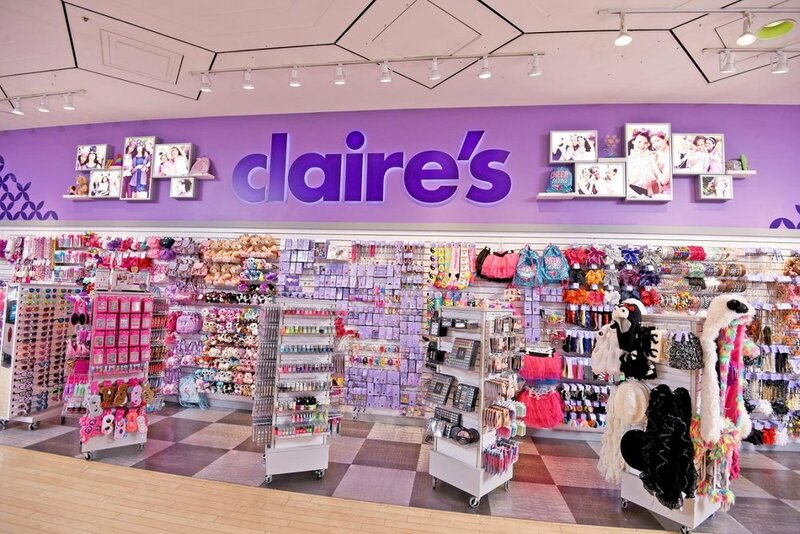 Asbestos has been found in more products sold at Claire's stores. After pulling nine of its make-up products, Claire’s had private lab testing done that showed the products were asbestos free. The fashion accessory chain then issued statements denying claims that their products ever contained asbestos; however, a new wave of lab reports has found this claim to be false. The tests, carried out on behalf of consumer interest group US.PIRG, found an additional three makeup products sold at Claire’s stores tested positive for deadly asbestos fibres. Claire’s has denied these claims made by US.PIRG, citing its previous lab results and criticising the research methods undertaken by US.PIRG. 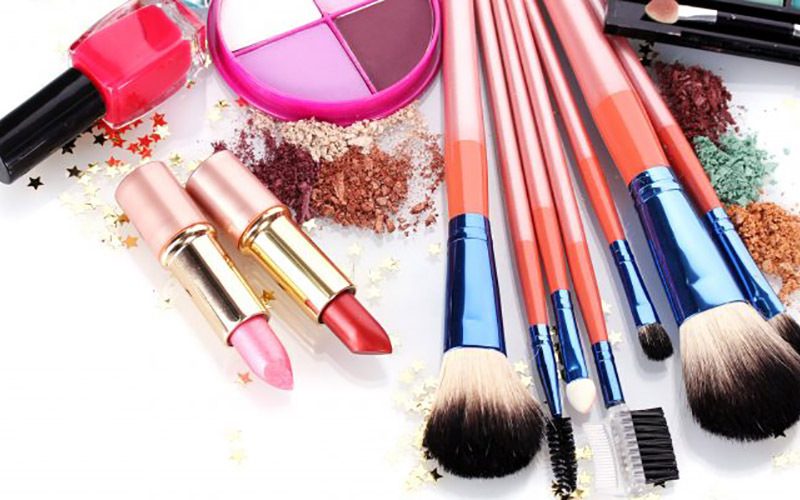 The outlook is equally grim for Claire’s stores in the UK, where the chain has been ordered to destroy two of its make-up products: the highly popular eye shadow and face blusher kits. The face blusher kit is just one of the products sold at Claire's UK chains that was found to contain asbestos. This order from the UK government comes after Dutch authorities found asbestos in the two Claire’s products. These findings were then confirmed by officials in Brussels which lead to a Europe-wide alert being placed on the products. Much like how it played out in the US, Claire’s is predictably claiming that their products are safe and asbestos free, as well as refusing to release how long the asbestos contaminated products were sold for. Since it is warn on the face there is a very high change of asbestos fibres being inhaled through the nose or mouth. Claire’s make-up is marketed to and predominately warn by teenage girls. The asbestos fibres were believed to be introduced to the make-up through talc, a common make-up ingredient that is used to absorb moisture and give the product a smooth feel on the skin. Up until the 1980’s asbestos was widely used as a building material in dwellings all across Australia, prized for its insulative and heat resistant properties. As a result, asbestos can be found in most older homes in locations such as splashbacks, fire places, walls, insulation, piping and underneath tiles. However, one place you might not expect to find asbestos is in the family car. The amount of mechanics making legal claims for exposure to deadly asbestos is on the rise. That's right, before asbestos was banned in Australia in 2003 it was not uncommon to find it in car parts such as brakes, clutches, gaskets and hood liners. Although the use of asbestos in housing products slowed down well before the 2003 ban came into affect, asbestos was still used in car parts into the early 2000’s. Today, asbestos is usually only found in cars built before the ban (such as vintage and classic cars), with the notable exception of vehicles and parts imported from countries where asbestos is still legal. Brake pads: Just one of the many places asbestos can be found in older cars. Sure, it has been illegal to use asbestos in car parts for close to 15 years here in Australia, but unfortunately that hasn't stopped mechanics from being at risk of asbestos related diseases. According to law firm Slater and Gordon, the number of mechanics requesting legal action for asbestos exposure has increased by 200% in the last two years. Asbestos exposure is associated with a variety of serious health conditions including mesothelioma, pleural disease, asbestosis and lung cancer. Often it can be difficult to gauge the damage of asbestos exposure as all these aforementioned diseases can take up to four decades to show any symptoms. For this reason we are only now seeing the impact of this latest wave of exposure. Australia is still facing the consequences of its toxic asbestos legacy. As Australia continues to grapple with high rates of mesothelioma and ongoing issues with asbestos, it is clearer than ever that the asbestos ban is not enough. We must remain vigilant and committed to removing asbestos from our communities and ensure we do not become desensitised to the serious health risks asbestos exposure can lead to. Asbestos Warning In Bushfire Ravaged Tathra. There is a long road ahead for the residents of the NSW town of Tathra. 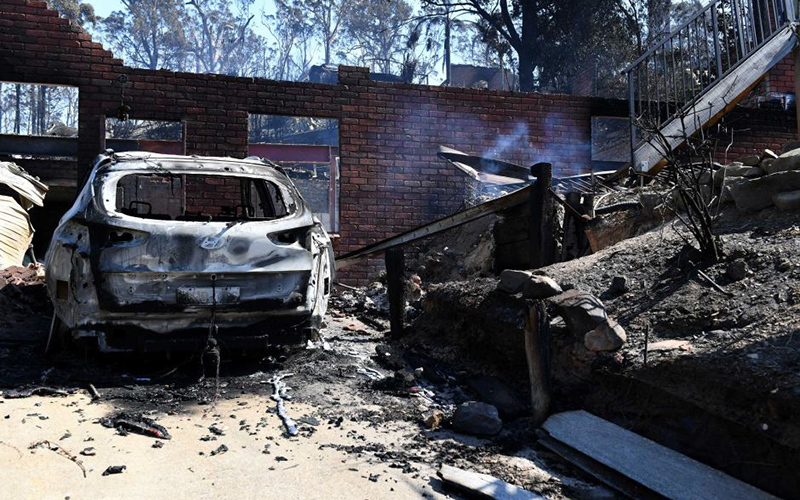 On Sunday the 18th of March a bushfire swept through the town damaging close to 70 homes and leaving destruction in its wake. The destruction left in the wake of the Tathra fire. Image taken by Dean Lewis for ABC news. Making matters worse is all the asbestos from the burnt and damaged homes that has become airborne after the fire. The fire was initially on track to miss the town by 100 meters before a strong gust of wind put it on a collision course with the Surfside community, propelling the fire through the centre of town. Fortunately, residents were able to be evacuated in time and to date there have been no deaths or significant injuries. Although the fire may have passed, the danger has not, with countless damaged homes now contaminated with asbestos as well as airborne asbestos fibres. This asbestos contamination along with structurally damaged buildings has prevented the displaced residents of Tathra - many of whom are staying in the Bega community centre - from returning home. Rural fire service crews have taped off damaged housing believed to be contaminated with asbestos and are awaiting samples to be lab tested for confirmation. 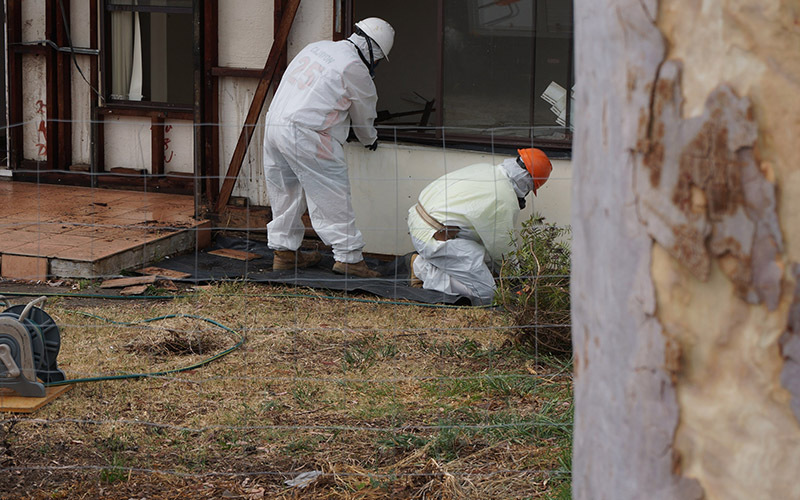 The clean-up and returning of asbestos contaminated properties to their owners is expected to be handled on a case by case basis with landholders liaising with authorities. As of last Thursday some residents have been allowed to return to the town to survey the damage caused by the fire; however, no one will be allowed to return permanently until the town is deemed safe by authorities. The tragedy that has taken place in Tathra is a timely reminder of the constant risk posed by asbestos and the importance of having it removed from our homes and communities. We sincerely hope what has happened at Tathra will act as a wake up call and fuel renewed efforts to say good bye to asbestos for good. Although Bushfires might be an unavoidable part of lviing in Australia, asbestos contimaination doesn't have to be. Every November the National Asbestos Awareness Month Campaign runs, seeking to inform the public of the dangers of removing or disturbing asbestos in the home. Even though the dangerous substance has been banned in Australia since 2003, we still have one of the highest rates of asbestos related diseases in the world, with home renovators most at risk. The aim of the Asbestos Awareness Campaign is to combat this high rate of asbestos related diseases by educating the public. Australian Actor John Jarret was one of the campaign's ambassadors in 2017. Here at Ausbestos we are big supporters of the important work the National Asbestos Awareness Month Campaigns performs, and do what we can to support their important mission all year round. Recently the campaign has released brand new asbestos education materials in the form of a series of asbestos fact sheets for tradies and an in depth asbestos management guide for commercial and non-residential properties. The National Asbestos Awareness Month Campaign has released asbestos fact sheets for professionals in a variety of trades/ industries. For more information about asbestos awareness month or to check out their comprehensive range of fact sheets, click here. 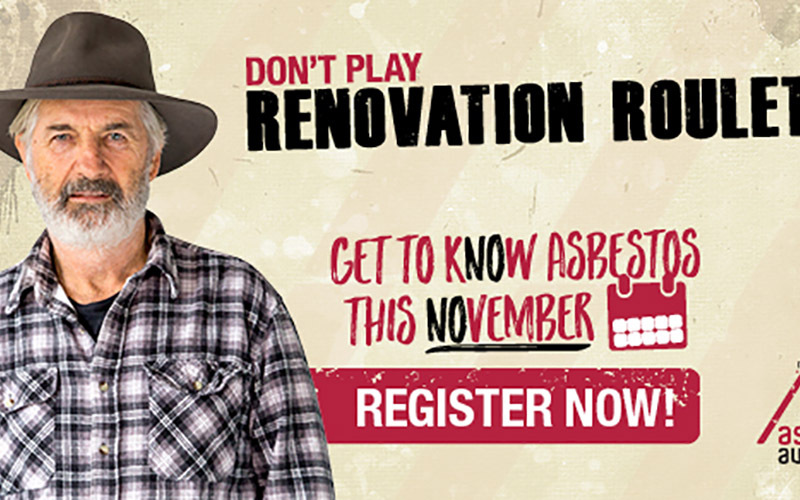 November Is National Asbestos Awareness Month. Asbestos is a silent menace lurking in many Australian homes. If your house was built or renovated between 1920 and 1990 there is a good chance it contains asbestos in one form or another. Sometimes hidden, sometimes in plain site, asbestos products may look harmless but if disturbed they release deadly fibres that can lead to serious health problems such as mesothelioma, lung cancers, cancer of the larynx and even ovarian cancer. Asbestos is at the greatest risk of being disturbed during renovation or demolition and if your are considering undertaking such works then it is important asbestos is removed and disposed of by trained professionals. Our asbestos removal crew removing asbestos sheeting from a asbestos clad fibro home. Sure, I understand the dangers asbestos poses but how much will it cost to get it out of my house? This is where things get a little bit complicated. A variety of factors, such as the type of asbestos present, the amount of asbestos present and the location of the asbestos present all affect the amount of time taken, and therefore the cost, of removing asbestos. Asbestos can be found in a variety of locations around the home, such as underneath vinyl or linoleum flooring, in fibre cement products and in insulation products - just to name a few. 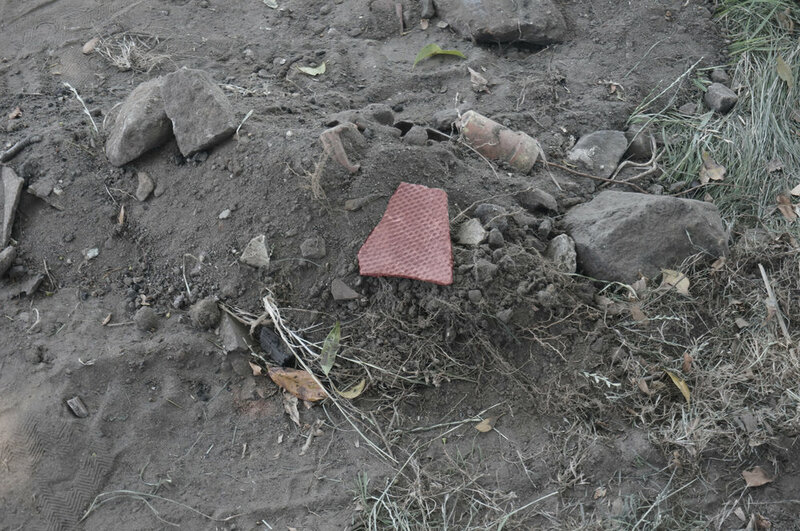 In some cases soil may be also be contaminated with asbestos, usually in the form of chunks of asbestos sheeting. As a general rule, asbestos products come in two forms: non- friable and friable (commonly known as 'Mr. Fluffy'). Non-friable asbestos is cheaper to remove as the dangerous asbestos fibres are incased - in cement or other material- and therefore less likely to become airborne. This in turn means less safety precautions and time are required to safely remove non-friable asbestos products. Asbestos sheeting can easily be recognised by the wafflle patern on its underside. However, removing non-friable asbestos is still time consuming and tedious, as each piece of product containing the dangerous fibres must be removed individually by hand, wrapped in plastic film and placed in a dumpster. Some non-friable asbestos products like fibro sheeting can be particularly time-consuming to remove, especially if it is covered by a brick facade. The final factor to consider is the cost of legal disposal of asbestos, which costs roughly $330 per tonne to dispose of. Obviously this means the more asbestos is present in your house, the more it will cost to safety and legally dispose of it. Here's What You Need To Know About Non-Friable Asbestos. As we've previously discussed on this blog, before the health risks of exposure to asbestos were known (and in many cases even after), the mineral was widely used in everything from building materials to roof insulation to break pads to sand pit filler... and now apparently, even make-up. A lab in North Carolina, USA, recently found trace amounts of tremolite asbestos in a Claire’s (A chain of accessory stores) make-up product aimed at young girls. Although never used commercially, tremolite asbestos is often found in talc, a key component in many make-up products. The tremolite was discovered when a local mother decided to send a sample of her daughter’s make-up into a local lab to see what was in it. What was meant to be a fun indulgence of curiosity took a dark turn when the results showed asbestos was present in the make-up. Claire's initially pulled nine of its cosmetic products as a precautionary measure; however, after conducting its own testing with two different labs, Claire’s has released a statement refuting the claim their make-up products ever contained traces of the deadly mineral. A spokesman for Claire’s also added “Any report that suggests that the products are not safe is totally false”. Accessory chain-store Claire's was forced to re-call nine make up products after reports came out that they contained traces of tremolite asbestos. Despite Claire’s claims, the lab that conducted the initial testing that found the asbestos is standing by their results, asserting that asbestos was found in a variety of Claire’s make-up products and questioning the validity of the tests conducted by Claire's. This isn’t the first time asbestos has been allegedly found in make-up. Mid last year American chain store, Justice, stopped selling its ‘Shine Shimmer Powder’ after an investigation revealed it contained asbestos. Given that asbestos can lead to serious health problems, the presence of the mineral in make-up products is particularly concerning. Here is hoping this latest incident is the last time the mineral is found in cosmetics products. Although the use, manufacture and importing of asbestos and asbestos based products has been banned in Australia since 2003, our nation's past enthusiasm for the dangerous mineral continues to haunt us to this day. The repercussions of Australia's previous wide-ranging and liberal use of asbestos can be felt both in our high rates of mesothelioma and our legacy of buildings containing the deadly mineral. Asbestos can still be found lurking in the family home (mainly those built or renovated before 1980), in iconic buildings such as the Sydney Opera House, and most troublingly, in Australia's public schools. A recent audit has found that a majority of Australia's schools contain asbestos based products. In Victoria for example, out of the 1,712 schools inspected, only 39 were found to be free of the dangerous mineral. In New South Wales it was a similar story; asbestos was present in hundreds of schools in Northern NSW, mainly in the form of roof tiles, roof sheeting and external window panels. These findings are concerning as all forms of asbestos pose a serious risk to human health. Inhaling the substance is linked to cancers such as mesothelioma, lung cancer, cancer of the larynx and even ovarian cancer. Children breathe in more rapidly than adults as their lungs are still developing. This means they are more likely to breathe in any deadly asbestos fibres that are present in the air. Due to the delayed onset of most cancers caused by asbestos - particularly mesothelioma which can take 30 years for symptoms to develop - asbestos poses a greater risk to a child's life expectancy than to an adult's. Children are estimated to be 3.5 times more likely to develop mesothelioma than adults. Children are at a higher likelihood of asbestos exposure because of their active play habits that could disturb or damage asbestos containing products. If disturbed, asbestos fibres can become airborne and are easily inhaled. In order to reduce the likelihood of students and staff being exposed to asbestos, all Australian state governments require schools containing asbestos to have an asbestos management plan in place. This plan must be in line with the 2011 Federal Work, Health and Safety Act and involves any area found to be contaminated with asbestos being fenced off. In response to the high amount of schools containing asbestos, the Victorian government has pledged $155 million towards removing asbestos from its state schools with the ambitious goal of making all state schools asbestos-free by 2020. This involves both the removal of asbestos where possible and the demolition of buildings too contaminated with asbestos to simply have the substance removed. Infographic outlining the Victorian Government's plan to rid schools of asbestos, courtesy of the Victorian Government School Building Authority. The Victorian government's plan commenced in the first half of 2016 and prioritised 'high risk' buildings, which have all since been removed. Here's hoping the rest of Australia's state governments follow suit soon so we can rid all our schools of this dangerous materal. Hiding In The Roof Sydney Man Buys Home riddled with dangerous friable asbestos. Police are on the hunt for the culprit responsible for dumping 8 tonnes of asbestos contaminated materials on a suburban street in Chester Hill. Residents of the Western Sydney suburb woke up Monday morning to find debris scattered all over the road after being illegally dumped at 1am that morning. The road was soon taped off by police as fire crews in hazmat gear began to sift through and clean up the dumped material, which consisted mostly of asbestos contaminated soil. Asbestos contaminated waste dumped in the middle of the road in the Sydney suburb of Chester Hill. Understandably the residents of the affected street were not happy about the illegal dumping, with one commentator going as far as calling the individuals responsible for dumping the material ‘potential murders’. Sure, the phrasing might be a tad dramatic, but the links between asbestos and fatal health conditions like mesothelioma are well established, meaning that the dumped materials pose a serious health risk to the affected street’s residents. Although it may not make the headlines, asbestos contaminated soil is sometimes found when undertaking demolition, excavation or construction works. Most home owners are completely unaware that there could be unwanted asbestos buried underneath their house foundations or below their backyard. This is usually due to illegal and improper disposal of asbestos from past demolition, renovation or building works. Regardless of how it got there, the result is the same: broken pieces of asbestos sheeting scattered throughout the soil. These pieces of asbestos sheeting are easily identified by the waffle-shaped pattern on their underside. Asbestos fibre board often features a walfle pattern on its underside. All the contaminated soil can be excavated and disposed off as asbestos contaminated waste. Although straightforward, this solution means that all the soil must be disposed of as asbestos waste, costing roughly $330 to dispose of per tonne. If the contamination is mainly surface level, an asbestos removal crew can be brought in to hand-pick the pieces of asbestos from the soil. Although tedious, this ensures less asbestos waste and therefore a lower disposal fee. Asbestos hiding amongst the soil. Both of these options require a trained asbestos removal crew and supervisor to undertake and supervise the asbestos removal works as well as a third party certifier to approve that the previously contaminated area is now free of asbestos. Although alarming, by acting quickly and soliciting a professional asbestos removal company, asbestos contaminated soil can be throughly and safety removed. Sydney's Most Relentless Asbestos Offender. Living in Australia, it is all too easy to assume that asbestos is feared and strictly regulated all around the world. Unfortunately, this is far from the reality and countries like China, Cuba and India still rely heavily on asbestos based products for automotive parts, building materials and insulation. Even the US continues to import large amounts of asbestos, importing 705 metric tons in 2016, almost twice the amount imported in 2015. So, where is all this asbestos coming from? Although it isn’t the only country that still mines the dangerous mineral, Russia is by far the biggest miner and exporter of Asbestos, supplying roughly 60 to 75 percent of the world’s asbestos. In Russia, the deadly health risks associated with asbestos are covered up and it is even believed that the Russian mafia is behind a powerful pro-asbestos lobby. In short, the Russian love affair with asbestos is still very much in full swing, and nothing showcases this quite as well as the Russian mining town of Asbest. The Uralasbest mine is 11 km long, 2.5 km wide and 300m deep! Like the name suggests, Asbest (which takes its name from the Russian word for asbestos), exists for the sole purpose of mining asbestos. The town is home of the Uralasbest mine - the world’s biggest functioning open-pit asbestos mine which is almost half the size of Manhattan! During its 100 years of operation the mine has shipped well over 384 million tonnes of asbestos all around the world. To say the town of Asbest embraces asbestos would be somewhat of an understatement. Residents have an almost religious reverence for the stuff, seeing it as the town’s protector. 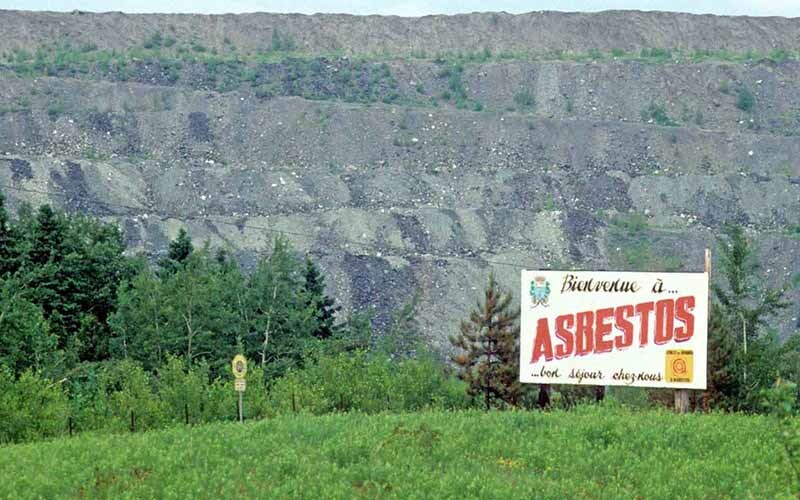 Asbestos is referenced in folklore (such as stories about a girl with fibrous hair made from the mineral), billboards in town proudly proclaim ‘ asbestos is our future’, and it is not uncommon for newly weds to have their photo taken overlooking the huge Uralasbest mine . It is not uncommon for people to take pictures overlooking the mine. Where Australians see the use of asbestos as a terrible mistake of the past, the Russians of Asbest view it as a sort of guiding light for the future. 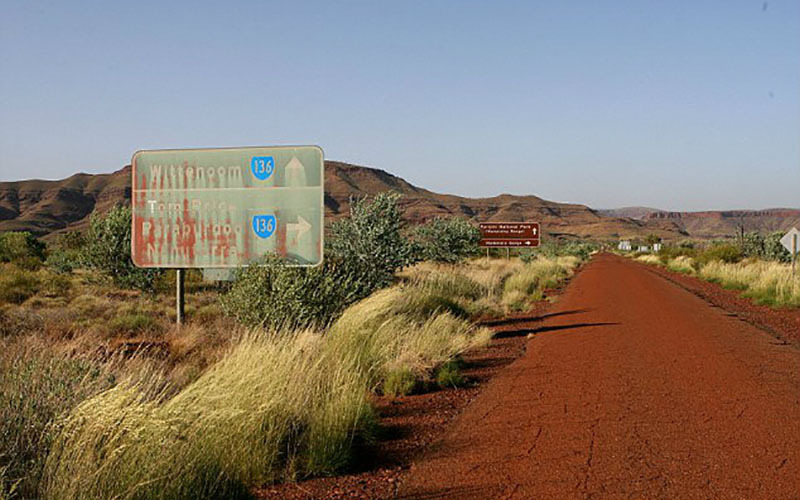 Much like the now closed Australian town of Wittenoom, Asbest would cease to exist without the asbestos mining industry, of the 70,000 people who live there, 49,000 of them are directly or indirectly reliant on the Uralasbest mine for income. To make matters worse, the company that owns the mine also owns a significant amount of the town’s infrastructure. This means that for most of the town’s residents speaking out against the mine or acknowledging the health risks posed by asbestos isn’t really an option. As the global demand for asbestos gradually decreases, the future of Asbest looks more and more uncertain. Regardless of what the billboards in the town might say, the wide scale use of Asbestos has no place in the modern world. When Hurricane Matthew swept through Cuba’s Guantanamo province late last year, stories about how Cuban companies were making and distributing building materials to help the victims quickly made it into the nation’s news cycle. Whenever the country is ravaged by a hurricane, one of the most repeatedly broadcast images on Cuban television is that of factories churning out asbestos-cement roofing sheets. Largely an exercise in morale boosting, these images of industrious factory workers working hard to manufacture roofing materials for those in need warms the heart of the nation. As is well known in most of the developed world, asbestos causes a wide variety of health problems if inhaled as it doesn’t dissolve or break down. This is because asbestos particles do not evaporate into air and don’t dissolve in water, meaning they linger around for a long time and are easily carried by wind or water. Drinking water can contain asbestos, especially if water pipes are made out of fibre cement. Piping made from asbestos fibre cement. The link between exposure to asbestos and diseases such as lung cancer has been known since 1935. In 1991, the World Bank decided not to finance the manufacture or use of products containing asbestos. This subject shocked the world again in 2001, after the World Trade Centre collapsed, when asbestos dust was released into the air. Inhaling abestos dust can lead to a variety of serious health problems. The World Health Organisation, international medical institutions and US regulatory authorities have drawn up a list of products that contain asbestos and cause cancer in humans. The use of asbestos has been banned in every developed country for decades now, although asbestos use continues in some developing countries, such as the aforementioned Cuba. The international ban on asbestos is governed by the Rotterdam Convention (in effect since 2004), signed by over 100 member states, but not without controversy as some countries still mine and produce asbestos. Fortunately here in Australia, there has been a full ban on asbestos since 2003, and we sincerely hope Cuba, and the rest of the world for that matter, follow suit soon. Asbestos Mining Towns: Asbest, Russia.